All of the recent developments occurring in the newly legal cannabis industry have everyone asking: how can I get a job working with marijuana? Another question I frequently get asked is: who is suited for these jobs? The answer to the first question requires a little more explanation, but the answer to number two is pretty clear. Practically any adult can work in the legal cannabis industry, either with a hands-on weed job, or an associated career. In order to explore the best marijuana jobs for extroverts and other socially inclined folx, we have to first have to look at the hottest jobs on the market. When compiling a series of the best marijuana jobs for extroverts, budtender immediately comes to mind as a pivotal position for outgoing, talented salespeople. Budtenders constantly interact with customers and other budtenders and dispensary workers throughout their shift. Budtenders really need to be team players, considering how seriously the correct implementation of compliance measures is taken by the government. What is a budtender? Borrowing its name from alcohol servers, budtenders facilitate the direct sale of legal cannabis products and paraphernalia from recreational/medical dispensaries to adult customers and patients. While it seems like every stoner on the block considers themselves a cannabis connoisseur with a developed palate, being a budtender requires more than being a regular pot smoker. Budtenders know their products from front to back, and can give a more detailed description than whether the weed is sativa or indica. How is Budtending Suited to Extroverts? Budtending jobs are sales positions, and an important one at that. Especially when assisting medical patients, budtenders must use their critical abilities as outgoing, knowledgeable servers, in order to help patients choose the correct medical cannabis or recreational products to suit their needs. As High Times points out, a significant skill the best budtenders possess is the ability to storytell. It is not at all uncommon for customers to ask the budtender for advice or their experience using particular products. It is up to the budtender to be able to synthesize the information and form shrewd suggestions for the best products for consumers. A budtender can legitimately make or break a dispensary. Especially since new cannabis users make a large contribution to the success of the legal cannabis industry, dispensaries need knowledgeable, friendly budtenders who draw customers in, rather than push them away with condescending or overly esoteric talk. So, we know how cannabis is grown, and we know how it is sold in dispensaries, but what happens in between? 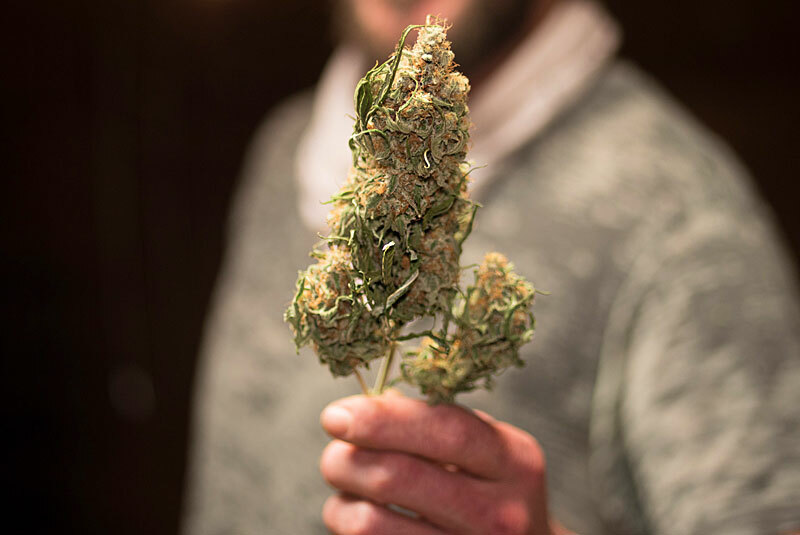 The process of disbursing legally grown and processed cannabis merchandise from grow operations, production kitchens and extraction labs requires cannabis sales representatives, one of the best marijuana jobs for extroverts. These salespeople are stockpiled with all the regulatory knowledge and cannabis experience to try and get dispensaries to buy their products. Cannabis sales representatives carry the brand of a product, visiting dispensaries and building business partnerships. Whether they are performing product demonstrations as brand ambassadors to increase brand exposure and awareness or coordinating deals between cannabis production companies and pot shops, sales reps ave one goal, and it’s to win people over with their product. How is Cannabis Sales Representation Suited to Extroverts? Marijuana sales reps have to be good talkers–they make partnerships based on their ability to make deals. This sort of sales position requires a passionate, outgoing individual, who isn’t deterred by unenthusiastic responses. While every aspect of the cannabis cultivation process may not cater to an extroverts desire for human interaction, there is a significant amount of teamwork and communication that helps grow operations to thrive and turn out a successful crop. Being a master grower is one of the highest ranking positions and best marijuana jobs for extroverts. Of course, master growers are responsible for leading the cultivation process. Not only does this mean they must formulate plans to make cannabis plants grow and thrive, they might also be required to hire and train subordinate employees such as assistant growers or farm staff. Grow operation leaders or owners are also important cogs in the grow machine, and they are responsible for running and operating things to ensure a successful harvest. How is Growing Suited to Extroverts? The higher cultivators climb in a grow operation, the more responsibility they will have. Tough growers don’t necessarily need to be extroverts, the job is definitely more suited to those who feel confident communicating, and can make swift, concise statements to fellow employees and subordinates, without falling behind in the day. Additionally, gro-op owners and leaders need to be able to communicate with their associated production facilities, merchants and other partners in order to sell their crop. Sometimes the best thing you can find in a marijuana industry worker is a great communicator. For those who find communication to be an asset, this really is the best marijuana job for extroverts. Marijuana delivery jobs are slowly coming out of the woodwork now that recreational delivery services are being allowed to operate more and more alongside medical deliveries. Though cannabis dispensaries themselves are not allowed to deliver their own products, third party courier services are allowed to transport products from one place to another, charging a fee for their services. On a medical level, marijuana delivery is important. Especially for individuals with limited mobility and access, delivery services could make or break a medical marijuana patient’s ability to receive their products. This makes marijuana delivery another addition to the best marijuana jobs for extroverts. Like delivery services in other industries, marijuana delivery is suited to a culture that wants everything as fast as possible. For this reason, delivery rider travel by car and bike to reach customers as swiftly as possible. Especially for those marijuana patients or customers looking to be discreet with their cannabis consumption, delivery services are great for going stealth. How Is Marijuana Delivery Suited to Extroverts? Marijuana delivery is a customer service position, automatically making it an opportunity for extroverts to thrive. Delivery drivers will encounter customers and other workers on a daily basis, communicating in person, over the phone and online to facilitate a sale. The American cannabusiness is helping to bring green into every other industry in country. Especially in Colorado and west coast cities, marijuana tourism jobs are bringing in significant state and city revenue through highly taxed products and great tour packages. Companies like Kush Tourism offer packages that include the tours themselves, associated lodging packages, rent-a-vape and more! Being a tour guide involves showing interested customers around cannabis industry environments such as grow operations, dispensaries, edibles kitchen, extraction labs and more! While tour guides must meet the necessary qualifications for any job of the sort, they must have cannabis industry knowledge and be able to speak on the subject in a professional, fun and informed way. Since tour guides are at the center of attention throughout their shift, the position can be easily viewed as one of the best marijuana jobs for extroverts. How is Marijuana Tourism Suited to Extroverts? Being a marijuana tour guide ensures you are an extrovert who thrives in a leadership role. When you lead a tour, all eyes are on you and tour participants might actually listen to what you’re saying. Tour guides must be confident, able to keep the tour on schedule, cull any awkwardness or uncomfortable moments within tour participants and ultimately try to create a fun atmosphere. Like budtenders, receptionists who work in dispensaries do the grunt work of getting products from under the counter into rolling papers. Receptionists deal with the same customers as budtenders, though they are more concerned with checking in customers and processing their identification than they are with offering specific cannabis product information. Marijuana dispensary receptionist jobs is a dual position in that it has both customer service and administrative qualities to it. Receptionists are in charge of always keeping compliance, effectively using online databases to keep records of customers, follow up with any business inquires or partnerships and generally keep everything in the waiting running smoothly. How is Reception Suited to Extroverts? Receptionists have to be quick and able to think on their feet, without the constant supervision of a manager. Extroverts are especially suited to this job, as it involves a steady stream of communicating with customers–not just in person, but over the phone and via email and social media as well. Often, dispensary receptionists work double duty as budtenders, especially in smaller shops were two distinct positions aren’t necessary. Receptionists who are able to roll with the punches and successfully assist customers, while keeping organized are likely to succeed in a thriving dispensary atmosphere. Best Marijuana Jobs for Extroverts: More Where That Came From! Good news for all the extroverts out there: there are plenty of jobs, especially in the customer service sector of the cannabusiness. When it comes to the best marijuana jobs for extroverts, many of these positions are going to be sales or leadership oriented, so it takes a dedicated student of cannabis to perform well in the industry. Extrovert qualities have been historically celebrated in the cannabis industry and in business in general. While it is certainly possible for introverts to experience great success in this industry, extroverts are often found in major decision making roles that involve management and high levels of accountability.